Throughout the country, some state wildlife agencies seem to be hearing the call. Hunters are dropping out at alarming rates for a variety of reasons, but one that continues to surface is the lack of quality places to hunt. Existing public lands are already crowded, and private farmland is developed at a rate of about 1 million acres per year. The numbers are telling. Hunters simply have no place to go without bumping into each other, so many are calling it quits. But there`s a new land run--a push by many state wildlife agencies to open up more land, create more opportunities and provide a higher quality hunt. And it just might be instrumental in recalling many of those hunters who dropped out. Private land lease programs and easement purchases, and the creation of new opportunities on public land that was historically closed to hunting, are all helping to reverse a trend. As a result, more state hunting land is available now to the public than has been in decades. One of the most popular and creative ways wildlife managers are giving hunters a place to enjoy their sport is through private land lease programs. It`s a pretty simple concept: state wildlife departments lease hunting rights from private landowners at competitive rates with the stipulation that anyone can hunt the property without asking permission. Generally, landowners are free of any liability and the hassles of dealing with a steady stream of permission-seekers. 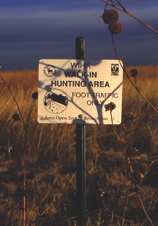 Wildlife department staff post the property with signs marking walk-in area boundaries and help manage the wildlife on the property. Kansas tested a lease program in 1995 when wildlife managers enrolled about 8,000 acres in seven counties. The program was so successful that the Kansas Parks and Wildlife Department took it statewide and enrolled nearly 200,000 acres the following year. Now, they are close to reaching their goal of providing an additional 1 million acres of hunting land that wasn`t there a decade ago. South Dakota also has nearly 1 million acres under contract, and Nebraska, North Dakota and Colorado all have similar programs with thousands of acres of prime land. Brad Simpson, private lands coordinator and head of Kansas` Walk-In Hunting Area program, says the lease program not only created additional hunting opportunities, but it brought back what so many rural towns depend on in the winter--nonresident hunters and their money. In 1996, nonresident hunter numbers dipped to about 33,000. Just seven years later, that number jumped to nearly 50,000--solid proof that many hunters will come back if they have a quality experience waiting for them. "The basic concept for our walk-in hunting area (wiha) program was to alleviate the burden on hunters who spent much of their time knocking on doors and looking for a place to hunt. We wanted to create as much opportunity as we could. It`s worked," he says. "The landowners are also relieved of the burden of people asking for permission to hunt." Kansas` wiha program has also been a hit with landowners for another reason. Much of the land enrolled in the walk-in hunting program is already enrolled in the Conservation Reserve Program, part of the 2002 Farm Bill that pays farmers to keep land out of crop rotation and planted in native grasses. In other words, Kansas farmers who are enrolled in the crp and in the state`s wiha program double-dip and receive a check from the federal government as well as the state game department. "We use federal grant money (Pittman-Robertson funds) to cover about 75 percent of the cost, and the department picks up the remainin 25 percent," explains Simpson. "I`d say we come out slightly ahead with expenses." for those without access to private lands. a stamp in addition to a regular license to utilize its walk-in access areas, but wildlife officials there are taking the access program a step further by paying a premium for premium land. The higher quality the habitat, the more farmers get for the hunting rights. Kansas wasn`t the first Western state to attempt a private-land lease program. Oklahoma paid wheat farmers for dove hunting rights from 1988 to about 1993. At its peak, hunters had access to about 20,000 acres, most within an hour of Oklahoma City or Tulsa. But the program, which got mixed reviews from the state`s hunters, ran out of money and had to be scrapped. Wildlife officials in Oklahoma are considering a pilot program modeled after other Midwestern states` walk-in lease programs, says senior biologist Russ Horton, and the legislature there recently passed a bill that will require hunters to purchase a $5 habitat stamp to help fund the purchase of additional public hunting lands. About half of Wyoming is either Bureau of Land Management property or national forest land, but much of it lies behind private property, either completely surrounded by private holdings (known as landlocked) or accessible only through a lengthy trip via foot or horseback from a distant public access point. Land patterns are similar in some other Western states. But Montana, Idaho, Wyoming and other states are giving hunters the keys to some of that landlocked public property through innovative programs that use cash as an incentive for private landowners. Wyoming, for instance, instituted an access program that relies on donations from hunters and public and private organizations, and has succeeded in creating more hunting opportunities on both public and private property. Under the state`s Hunter Management Area (hma) program, the Wyoming Department of Game and Fish leases large tracts of land (often entire ranches) for hunting rights, but it targets landowners who control access to landlocked blm or national forest property. It not only creates additional hunting on private property, but also public land that was essentially unreachable. Matt Buhler, state access coordinator for the wdgf, says the hma program uses donated funds to lease private property and purchase easements to public lands. In 2000, its first year, donations were under $100,000, and the program enrolled 123,000 acres of private land. In 2003, donations topped $143,000, and more than 672,000 acres of private land were enrolled into the program. One parcel of hma land includes 48,000 acres of private property, yet creates access to nearly three times that in formerly inaccessible public land. "When we count national forest land, we only count the section of public land bordering the private land," says Buhler. "So in theory, the amount of public land we create access to is actually quite a bit higher than what we list." He adds that the hma program, along with the state`s walk-in access program (similar to Kansas and other pheasant belt states), have netted 2.4 million acres of public and private land that just a few years ago was either unhunted or hunted by a select few. Statewide hunter participation has increased, and that translates to more money to help fund the department`s operations. "It`s a win-win situation," Buhler says. "The landowners get help managing not just the wildlife, but hunters. We handle all the permits, which are free, so the landowners aren`t burdened with keeping tabs on hunter numbers. 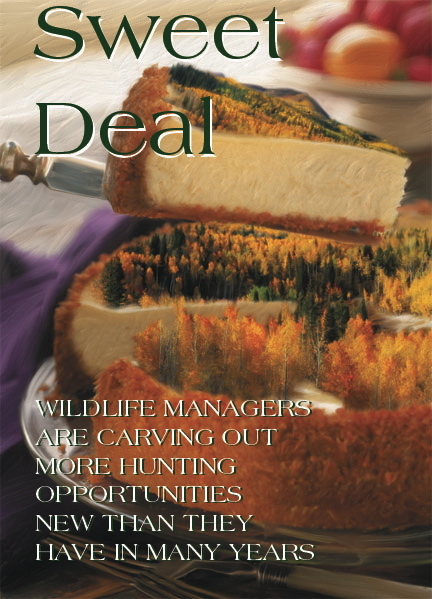 We get to sell more licenses because we are creating access to more game, and the hunters are getting a better quality hunt and more opportunity to have a successful hunt." Idaho and Montana have similar programs that use cash as an incentive to increase public hunting opportunities on private land and to open access to public land that is difficult or impossible to reach. Too Many Deer? More Hunters Additional hunting opportunities are opening in areas where either leasing or outright purchase of land by state wildlife agencies is impossible. In some Eastern states, land prices are far too high for cash-strapped fish and game departments to consider purchasing land, and farmland is often too divided to accommodate a large-scale lease operation similar to those in Western states. But that hasn`t stopped Massachusetts, Maryland and a handful of other states from creating more hunting opportunities for its constituents. Credit that to two factorsÐthe anti-hunting sentiment so popular in urban areas and the high reproductive rate of whitetail deer. "People are finally coming around to the belief that there are no realistic alternatives to controlling deer except hunting, and they`ve seen the results of managed hunts," says Doug Hotton, Maryland Department of Natural Resources deer project leader. "We are seeing more residents willing to allow bowhunters onto their property, and more constituents are less concerned about allowing controlled hunts on parkland where they used to be opposed to the idea." Bill Woytek, deer project leader for Massachusetts Wildlife, says he routinely approaches local governments and urges them to allow hunting on town-owned property. Numerous townships have listened to him. Woytek has taken a proactive approach by pursuing local governments long before they have a deer problem, but one township waited until whitetail numbers reached epidemic proportions before asking for a solution. "Wilbraham, which is east of Springfield, had a road-kill problem when they contacted me for a solution," says Woytek. "That first year, they had 66 deer/vehicle accidents. After three years of archery hunting, the number dropped to 19, all because they agreed to allow archery hunting on township property. They opened up about 1,000 acres in three or four different parcels and created additional opportunities that weren`t there before." He adds that nearly 3,000 acres of state hospital land will soon be opened to hunting for the first time in years. It`s also archery-only, but hunters can pursue deer and turkeys with a bow, offering a unique opportunity that wasn`t there just last season. Numerous other townships have agreed to hunting as well. Although hunter numbers continue to slide in Massachusetts, Woytek says bow hunter numbers have remained stable, quite possibly as a result of the additional opportunities created by the new lands and by the changing attitudes of residents living in communities overrun with deer. "We don`t set out to provide additional recreational opportunities when we hold these controlled hunts, but that`s certainly one of the benefits," says Maryland`s Doug Hotton. "The purpose is to control deer numbers, but ultimately, hunters win because they have more places to hunt. The controlled hunts in Montgomery and Howard counties are quite popular, and county biologists are considering letting some hunters take antlered deer this season." Across the Potomac River in the Virginia suburbs, Fairfax County officials gave the go-ahead for controlled deer hunts in county parks in 1998. As many as 2,000 acres have been open to hunting through tightly-controlled archery and shotgun hunts in a region rife with development and anti-hunting sentiment. Delaware is considering some sort of hunter certification program that would include training in ethics, landowner relations and a marksmanship proficiency test in order to create additional opportunities on private lands. According to Ken Reynolds, Delaware`s chief deer biologist, the state`s farmers complain about crop damage caused by deer, but many are reluctant to allow hunters out of fear of accidents, liability and other problems associated with poor hunter behavior. "If we can offer these landowners a group of hunters who have passed a series of ethics and shooting tests, then we might be able to create more hunting opportunity and reduce complaints about deer crop damage at the same time. Everybody would win," he says.